Mercury is a naturally occurring Earth element that is found in different chemical forms throughout the environment. It can exist as a gas and is released to the atmosphere through fossil fuel combustion, coal burning for energy production and outgassing from volcanoes. Mercury remains in the atmosphere for as long as one year, and can travel for miles reaching remote ocean regions. As mercury in the air is deposited to the ocean it is transformed to a chemical called monomethylmercury (MMHg). MMHg is able to enter the food web and is found in marine fish that are harvested for human consumption. Eating fish is the primary pathway of human exposure to mercury and can have serious health consequences. It is most dangerous to the developing fetus and can impede infant neurological development. Approximately 10% of women in the US of childbearing age have blood MMHg levels high enough to cause fetal damage. In adults, large amounts of MMHg can also cause neurological impediments and are suspected to affect cardiovascular and endocrine systems. In utero exposure to toxic monomethylmercury can have severe neurological and developmental consequences. Here, a woman in Japan holds her daughter who has been debilitated by methylmercury poisoning during the Minamata Disease outbreak. The most serious outbreak of mercury toxicity occurred in Minamata Japan in 1956. Wastewater from a chemical production plant was released to Minamata Bay containing high concentrations of mercury. MMHg formed in the bay and contaminated fish and shellfish harvested from the area. An estimated 10,000 people suffered from mercury poisoning, and 1,700 lost their lives. There is no way to remove mercury that is already contaminating our oceans and land, the only solution is to decrease inputs. Before policy implementations to reduce mercury emissions can be made, more concrete scientific evidence on mercury cycling and behavior in the environment is necessary. You won’t see labels like this at your local grocery store or market while purchasing seafood. That’s because under Proposition 65, the US Food and Drug Administration can only put warning labels on food containing man-made chemicals. Mercury in the environment comes from man-made sources, but also from natural sources. Once mercury is in fish, it is impossible to determine where the chemical originated. 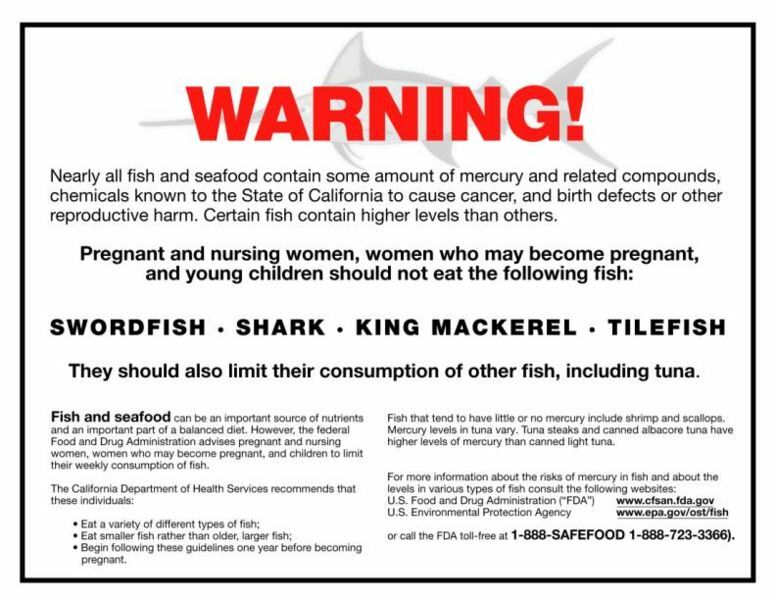 The label pictured above made a brief appearance in California before the Tri-Union Seafood Company won a court case excusing the industry from posting warnings of mercury in 2004.